Riot police used a former military vehicle to quell protests after the shooting death of an unarmed teen in Ferguson, Mo. The federal government has ordered three Massachusetts town police departments and the state Department of Correction to return military equipment, including grenade launchers, bayonets, and tracked armored vehicles, that they received as part of a controversial program. 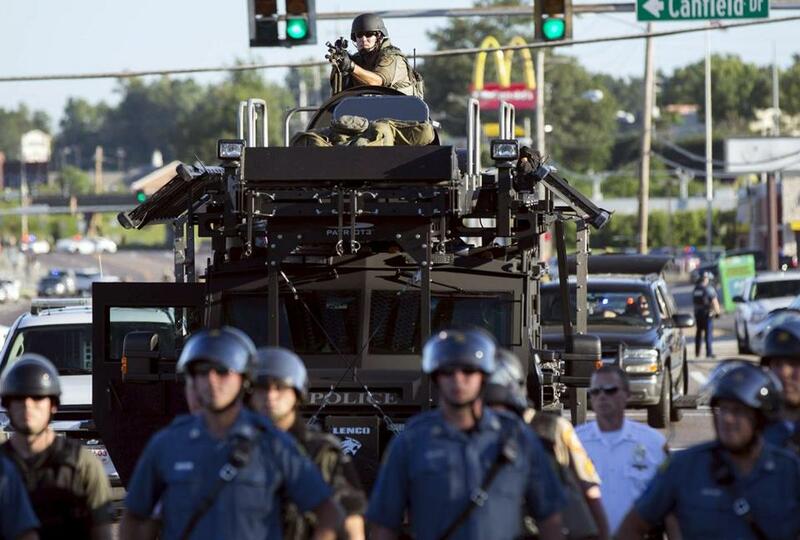 After concerns were raised over the use of military equipment by police during riots in Ferguson, Mo., in 2014, President Obama issued an executive order that established a working group to study the issue. He later accepted the group’s recommendations to curb federal programs that send surplus military equipment to law enforcement agencies nationwide. The scaleback included tightened restrictions as well as outright bans and recalls of certain types of military equipment. ■ The Norfolk Police Department, which had one tracked armored vehicle that has been returned, federal officials said. The items, including grenade launchers and bayonet knives, have been obtained through a program that President Obama is looking to scale back. ■ The West Springfield Police Department, which had two grenade launchers; the department said it is returning those this week. ■ The Clinton Police Department, which had 27 bayonets that the department said it returned last week. ■ The state Department of Correction, which had one tracked armored vehicle that has been returned, according to federal officials. Norfolk Deputy Police Chief Jon Carroll said the department returned its tracked armored vehicle a few months ago. The vehicle had been obtained by the department for use in operations run by the Metropolitan Law Enforcement Council, or MetroLEC, a regional consortium of more than 40 law enforcement agencies. The fortified vehicle was used to transport and protect personnel and their cargo. “If we need a SWAT team, if we have a barricaded subject or an active shooter, we’d call them,” Carroll said, referring to MetroLEC. Federal records show the vehicle was valued at $205,400 when the military services paid for it. The vehicle was sent to the Norfolk police on Nov. 4, 2009. “At the time we got it, it was the only armored vehicle available to MetroLEC,” Carroll said. 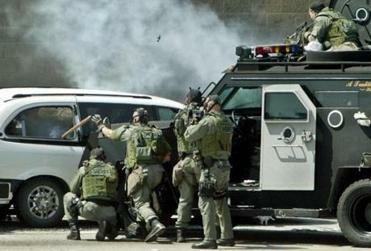 He said the vehicle was deployed on at least three or four occasions, but that it had not been used in recent years. “The need for it has gone down over the years,” he said, because MetroLEC has since acquired a BearCat wheeled armored vehicle. The tracked armored vehicle was once capable of carrying a 4.2-inch diameter mortar, but neither the mortar, nor any other weapons, were included when it was issued by the Defense Logistics Agency, federal officials said. They said the vehicles the agency supplies do not have any weapons systems or communications gear. Defense Logistics Agency officials said the returned tracked armored vehicles will be used on Defense Department military training ranges as more realistic targets for aviators and ground forces. “As far as I know we never used them,” he wrote in an e-mail. Federal data show the launchers were sent to the department on Nov. 28, 2006. They were valued at $720 each when the military services paid for them. Officer Joseph LaFrance said that the launchers were being prepared to ship back on Feb. 2. Clinton Police Lieutenant Brian W. Coyne said his department had acquired its 27 bayonets for use as a rescue tool. “These items were to be used to cut, pry, or in any manner thereof rescue people trapped due to accident, illness, or fall, in any vehicle or home [where] expedience was necessary,” Coyne wrote in an e-mail. He said the bayonets were issued to officers who wanted them and were not to be worn on their belts or openly carried. Officers were ordered to keep them in duty bags or the trunks of patrol cruisers. A Clinton police officer hand-delivered the bayonets to a representative from the Defense Logistics Agency at an air base in New Hampshire last week, he said. “Not having these items should not affect the department’s overall operations, as other rescue tools and equipment will be made available,” Coyne said. The bayonets were sent to the department on Aug. 20, 2014, and each was valued at $40.74 when the military services paid for them, records show. Federal records list the tracked armored vehicle that the Massachusetts Department of Correction returned as being valued at $205,400 when the military services paid for it. The vehicle was sent to the department on Aug. 30, 2000. Officials from the Department of Correction did not comment. The recall of items from the 1033 program officially began Oct. 1. The deadline to return recalled equipment is April 1, federal officials said. Nationally, a total of 126 tracked armored vehicles, 138 grenade launchers, and 1,820 bayonets are being recalled, officials said. As of Jan. 28, 80 of the vehicles, 105 of the grenade launchers, and 943 of the bayonets had been returned. The recall of some equipment has upset some local law enforcement officials, the New York Times reported last week following a similar report in November by FoxNews.com. None of the agencies in Massachusetts raised any criticisms. The 1033 program was created with Congress’ approval in the early 1990s and became more active after the Sept. 11 attacks. It has sent billions of dollars worth of equipment to police departments nationwide. Its aim is to assist local law enforcement agencies with crime fighting, particularly counterdrug and counterterrorism missions, officials said. The program transfers a wide range of excess equipment — including office equipment, blankets and sleeping bags, computers, digital cameras, and clothing. Weapons account for just 5 percent of all equipment provided through the program; tactical vehicles account for less than 1 percent, officials said. Agencies that receive equipment pay for shipping and for storage, repair, maintenance, and associated training costs, but otherwise the items are free. More than 8,000 federal, state, and local law enforcement agencies participate in the program. Agencies must meet certain criteria to participate and equipment requests undergo screening. As of Dec. 31, there were 121 different police agencies — including three college campus police departments — in Massachusetts that had some kind of equipment obtained via the 1033 program, federal data shows. Together, the agencies had 4,738 items that were valued at $10.9 million when the military services paid for them.